Movmnt Magazine Celebrates tonight’s season finale of Bravo’s Step It Up and Dance by giving away goodies from the show. Step It Up & Dance started with 12 professional dancers battling it out in a variety of styles from ballet and ballroom to Broadway and burlesque. At stake, the final call-back and a check for $100,000. With the season coming to a close, the competition is down to the final two. Who will be the ultimate dancer, Nick or Mochi? To find out, watch the finale of Step It Up & Dance airing tonight on Bravo. HOW TO WIN THE SWEEPSTAKE ? Enter now for a chance to win a Step It Up & Dance tank-top from with movmnt. 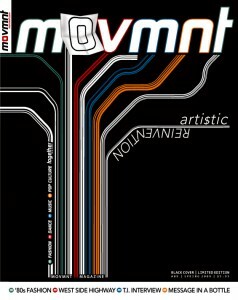 Three Grand Prize winners will each receive a tank-top and a copy of the latest issue of movmnt. Fill the form bellow and enter “STEP IT UP/MOVMNT” in the title. Include your full name, email, detailed mailing address, and how you’ve heard of movmnt and this offer. The winners will be contacted individualy and will recieve their gift within 4 to 5 weeks.